Giraffes are large African herbivores that grow to 19 feet in height and up to 2,800 pounds in weight. The animals live on the open grassland savannas of Africa. The combination of oppressive heat, arid conditions and large, deadly predators make life on the savanna a daily struggle, but giraffes have developed a number of physical and behavioral adaptations to survive these harsh conditions. The giraffe has a number of physical adaptations to help it live in the savanna. The dry, hot conditions in the giraffe's habitat are ideal for several flying, biting insects which can be irritating to the large animals. A black tuft on the end of the animal's long thin tail is an efficient fly swatter and keeps insects off the animal's rump. In males, the small horns that all adult giraffes grow are used during fights over dominance. Aiming the horns at the sides and necks of competitors, the males can injure and drive off other males. Giraffes are graceful as they walk on their long legs, but struggle to lay down and stand up. To avoid this vulnerability, giraffes often sleep standing up and rest their heads on their backs. The animal's height can be problematic when drinking, so the giraffe has developed a split-legged posture when at the water. It spreads its front legs awkwardly so it can lower its head to the river or pool. The giraffe's food source includes the leaves, pods and fruits of tall savanna trees. 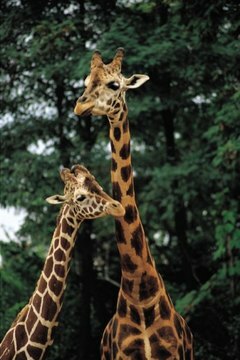 Because of this, the giraffe is very tall in order to reach the highest branches. A narrow muzzle and long, agile tongue also allow the animal to get at hard-to-reach vegetation. Tough, flexible lips also help the giraffe deal with thorny vegetation. These animals can eat up to 145 pounds of vegetation daily. Food is digested through a four chambered stomach to maximize nutrient absorption. Predation is the worst problem faced by giraffes so they have a number of defense adaptations. Traveling in family groups gives strength in numbers. The patterned coat of the giraffe helps to offer camouflage in the savanna habitat. The animal's size protects it from all but the largest predators with only small, sick or elderly animals being at risk from lions, leopards and crocodiles. Young giraffes learn to walk within 15 minutes of birth and will spend the first few weeks of life hiding in tall grasses from predators. Giraffes can also use their long legs to run at speeds of up to 35 miles per hour to outrun danger.